Peninsula Gardens Hotel. Luxury small boutique hotel Kas. A prestigious playground for the peninsula, patterned with private plunge pools. 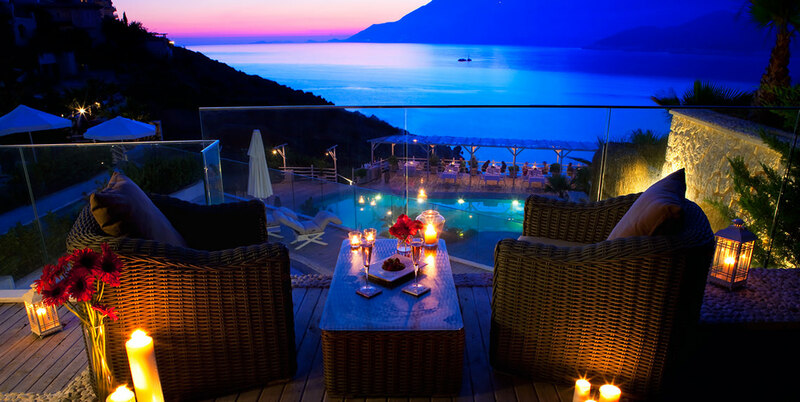 This is one of the most luxurious new hotels we have found on the Lycian coast. Literally from the ground up, The Peninsula Gardens has been designed to make the most of the craggy coastal cliffs on which it stands. There are two buildings, but the slope allows the second building to command just as splendid a view as the first. The ingenuity of the architects means, however, that walking around the hotel does not involve excessive climbing and, within each building, there are lifts to get you between the floors. Each air-conditioned room is appointed to a very high standard, with LCD plasma TV, DVD player, IPod docking station, safe, tea and coffee making facilities, iron, hairdryer and magnifying make-up mirrors. You also have Molton Brown toiletries, kimono style gowns, towelling slippers and beach towels.